There’s a pretty cool gimmick used for the plot here, where you see the same play twice, from two very different angles, but the film doesn’t have much else to offer other than that. 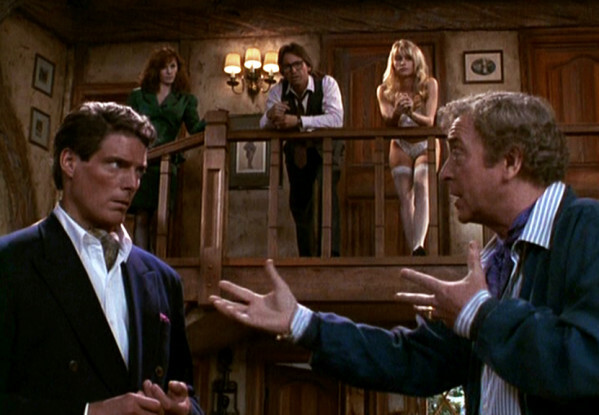 Noises Off is a movie with a clever gimmick of an idea, but not a whole lot more. The film is about a play and the actors who are making it. We spend as much time behind the scenes with the actors as we do watching the actual play itself. It’s like Birdman without all of the tracking shots, and with out the black-comedy uber dark tone. Here, it is replaced for slapstick. The first half of the movie is the rehearsal, where we get to watch the play on stage. The second half is where we spend our time behind the scenes and behind the curtain with the cast. It’s fun for a while, but then it gets carried away. Between the time jumps, the ridiculous level of physical slapstick, and the confusing way relationships are presented in the second half, this one definitely loses its way. Noises Off is clearly a movie made from a play. The content of the movie itself is about a play, but more importantly, the structure of the film was designed as a play. That means there are just a handful of characters, and only about two sets in the entire film. Those sets are on stage or behind the stage. Like Birdman, this one is all about the behind the scenes elements and interworkings of the relationships of people putting on a show. The plot works on a gimmick or single, unique situation. That gimmick is that each half shows the same thing from a different angle. In the first half of the movie, we watch a play being rehearsed, complete with plenty of interruptions from both the actors (who make all kinds of mistakes,) and the director, Lloyd Fellowes, (played by Michael Caine,) who is rightfully frustrated with his bumbling cast. In the second half of the movie, we stay behind the scenes, back stage with the cast, listening to the play off screen, and watching the cast members work out their issues with each other behind the curtain. We watch these actors interact backstage until they have to go onstage and deliver their lines. This structure makes for a pretty clever idea. And if the issues being dealt with in the plot were a little better, or the comedic elements were a little funnier, this one could have worked a whole lot more. From a technical point of view, the idea behind this thing is top notch. In the first half you both hear and see the play. You see scenes gone over multiple times (by the end of the rehearsal we know whether Mrs. Clackett, played by Carol Burnett, takes or leaves the plate of sardines even better than she does,) to the point where you become very familiar with them. And that helps for the second half, where we only hear the lines, off screen, and have to place them into context. The other thing that the first half does, is it really introduces us to the cast. The idea here is, let’s show the viewer the cast while in the midst of a rehearsal, so that when we get the behind the scenes later, the audience is both literally getting a look behind the scenes, (behind the curtain,) but also figuratively getting a look behind the scenes of these people’s lives. In other words, we don’t really learn much about the characters lives in the first half, because they are on stage rehearsing. So the second half is where things really get fleshed out. The problem comes with all of the time jumps. This movie has enough complications as it is, considering that each actor is playing multiple parts (playing both the actor performing a part, and also the character in the play itself.) Add to that the fact that in the first half, when we are first introduced to the characters, we are meeting two people at once, both the actor and the character in the play. And then add the time jumps in. The movie opens in the future, during the night of the Broadway premiere. Then jumps back in time to rehearsal. Then jumps forward (for the halfway switch,) about six months, and then jumps forward even more to that Broadway night. It’s too much. Perhaps a better way to tell this story would have been to do it in three acts, rather than two. What if the first act had been the auditions in a casting office? And each audition started with the actor just coming in and meeting the casting director? Something like we got in Reservoir Dogs, with each criminal coming in, sitting down in the office, and meeting the boss, Joe, before the robbery. Doing this would have enabled the viewer to meet the real actor before watching the actor take on a part. So the three act structure would consist of auditions, rehearsal, performance. That might have been easier to keep track of. The cast in this movie is top notch, and that’s important because this film really is a comedy that delves hard into slapstick as often as it can. There’s Christopher Reeves and John Ritter as the male actors on stage at a sort of vacation house, where both characters hunk that nobody will be there at this time of year. So both bring mistresses there. And then there’s the housekeeper occupying the place as well. What follows is a series of characters good big through doors, losing track of where the others are, hiding out of sight of the others, and all sorts of things like that. It’s somewhat funny, but a little too one-noted. What works a little better are the moments where the cast needs to stop working in order to handle a problem. When an actress loses a contact lense, for example, it pauses the entire rehearsal, as actors now get down on their hands and knees to search the stage for it. At another point, one of the actors, (Frederick, played by Christopher Reeves,) starts questioning the director about why his character wouldn’t just leave a box on a table instead of taking it with him into the basement. This leads to the director having to come up with a whole big explanation involving the characters back story, that is clearly made up on the spot, just to satisfy the actor. These kinds of moments all come in the first half. The second half is where the movie really falls apart. Not that it ever gets terrible or anything, but whatever positive elements this movie had going for it all came in the first half. It’s that middle of the film time jump that really hurts, suddenly changing up relationships, and expecting us to just go with it. The second half becomes such slapstick, with characters violently going after each other behind the stage, that it just gets silly and ridiculous. There were definitely some clever things about this movie, including its overall creative structure, but more attention needed to be paid to how much the audience could process, and how best to present all of it in a clear way. This one definitely ended up going off the rails in the second half.